Like Dustin Hoffman counting toothpicks, NBCChicago savant-ticiously tracks celebs. Star Maps is our weekly rundown of A-D-listers making the rounds in Chicago. Read on, judge harshly. This week, Britney Spears hit Chicago, stayed away from the nightclubs and, shock, played like a mom, taking her boys out for pizzas and shopping with them during the day. Ms. Spears was in town for the second leg of her Circus tour at Allstate Arena. 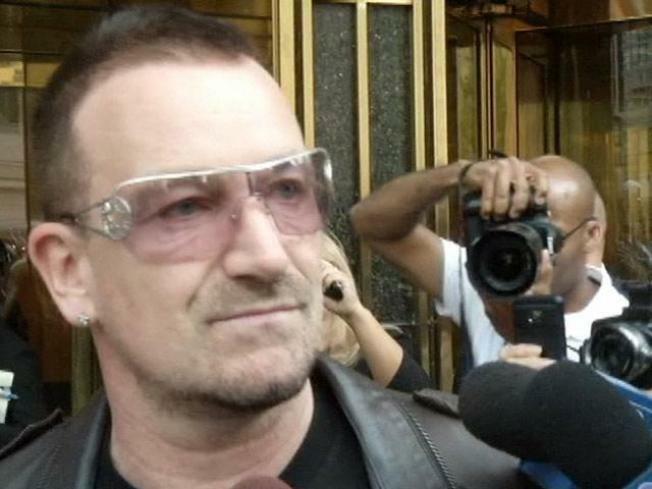 Irish rock lads U2 were here too, seen rolling through NBC Tower with their skinny-jean'd entourage in tow. In case you were living under a rock this past week, Oprah filmed her premiere episode on Michigan Ave. Sure, we love the press she gives our town but lets be honest; a trillionaire paying to shut Michigan Ave. down so we have to truck through loads of soccer moms to make it into the office is not our idea of a good time. The Black Eyed Peas, James Taylor, and new mom Jennifer Hudson performed. Giuliana and Bill made another appearence in the Windy City, which means that Giuliana flew back yet again to visit her hubby. And also seen around town was the super scandalous Ed Swiderski (is he faithful, is he not... the saga continues.....) with his fiance Jillian Harris. The duo dined at Boundary. According to RadarOnline, Jillian is finally moving in with him this week. And never fear, she's already put a "feminine touch" on his manly River North condo. Let's just hope she puts a "manly" touch on his feminine and super tight short-shorts. Yikes. It ain't pretty.